What comes to mind when you hear the word exotic? If someone said you had an exotic look, would you take that as a compliment? When it comes to exotic hardwood flooring, the word exotic is ascribed to any wood that is grown and harvested outside of North America. Are you the kind of person who likes to stand out from the crowd? If so, exotic hardwood may be for you. What Makes Exotic Wood Different? 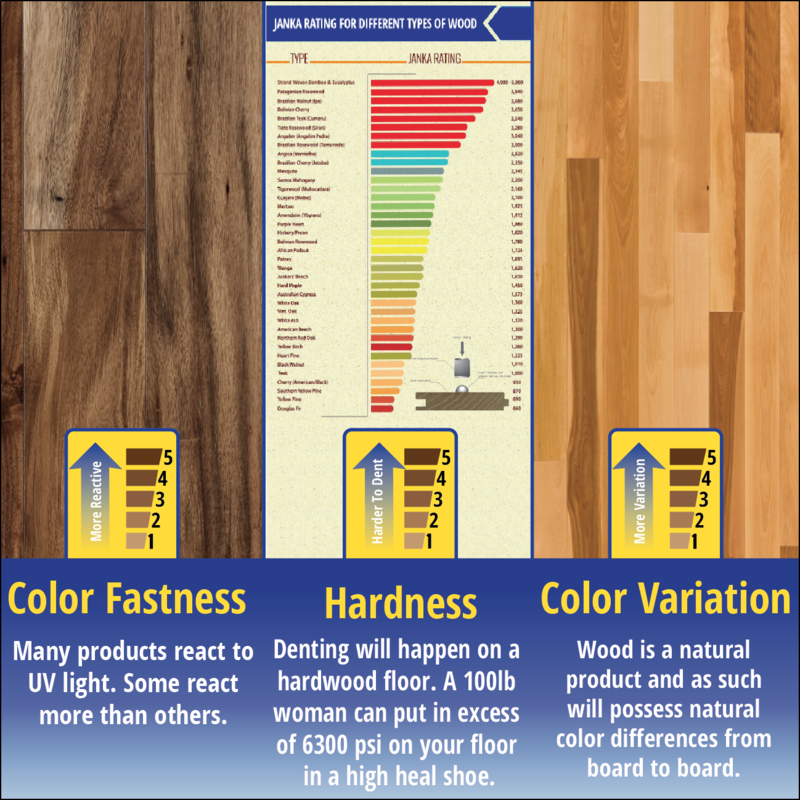 Using the Janka Hardness Scale, woods are assigned a number that indicates hardness. Exotic woods routinely score higher on this scale than domestic woods, making them ideal for flooring. Red Oak, which is commonly used in the US, scores 1290 on this scale. The most popular exotic wood, Brazilian Cherry, is rated at 2820. If you desire a look that is different from the crowd, read on to learn which are the best woods for exotic hardwood flooring. This is the best and most popular choice for exotic hardwood flooring. Although it is called Brazilian Cherry, also known as Jatoba, it comes from Mexico and Peru as well. It is red in color and exposure to sunlight actually enriches the color. It has a very unique grain, adding beauty to any home. Because of the variation of the wood, it is advised to open the cartons of wood to plan out your room before installing. Because of its hardness, this exotic wood is ideal for high-traffic areas, making it very attractive to homeowners with busy lifestyles. The heartwood of Brazilian Walnut is medium to chocolate brown in color. The sapwood offers a color that is a medium tan. Its irregular patterns make a very elegant statement in the home. On the flip side, this choice is actually strong enough to be used for the exterior of the home on a deck or porch. As its name may suggest, tigerwood is known for its thick, dark stripes on a lighter background. It gives a room a very dramatic look, especially when using wider planks. The stripes, however, are lightened by the sun, causing it to lose some of the contrast first seen when newly installed. Another popular choice for hardwood flooring, Santos Mahogany’s colors vary considerably but are more toned down than some other exotic hardwoods. The color is more of a brownish orange to a darker brown. It has a grain that is described as wavy and open. This is another wood with a color that is enriched by exposure to sunlight. If you are a fan of Fixer Upper (and who isn’t? ), this might be the choice for you. It is very rustic in appearance and will give your home that Joanna Gaines style. It has a very noticeable grain that makes a statement. It is lower on the hardness scale than a lot of exotics, however, making it less attractive to dog owners. Check out our exotic hardwood flooring page to see if which exotic hardwood flooring for is right for you.